The Type 2 diabetes (T2D) market is composed of dozens of agents that span a multitude of classes (e.g., GLP-1, SGLT2, and DPP-4) and formulations (e.g., oral and injectable). The conventional way to launch a new agent in T2D relies on a large primary care field force able to cover thousands of U.S. physicians. However, Lilly’s recent launch of Trulicity (GLP-1) pioneered a “specialty-first” approach, targeting endocrinologists (almost exclusively) in its initial weeks of launch. 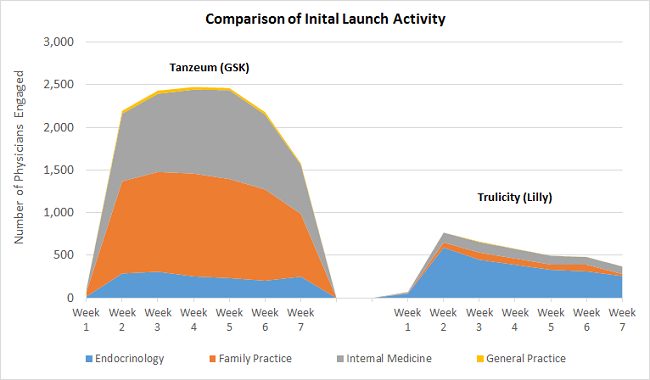 As a contrast, we’ve charted the commercial roll out of GSK’s Tanzeum, another injectable GLP-1, launched just four months prior to Trulicity. The difference is clear. Tanzeum made a large investment in primary care detailing whereas the Trulicity engagement model was endocrinology-centric. In fact, more than twice as many specialists were engaged by Trulicity vs. Tanzeum. Emerging T2D players without the luxury of an established primary care sales force should take notice: Lilly’s focused strategy combined with aggressive payer contracting has paid off as Trulicity’s uptake has eclipsed Tanzeum. How we can help: MDDetails can provide a granular view into market development efforts for recently launched products, helping to identify market-specific physician engagement strategies and best practices.